Lyrita’s reborn line of CDs continues to unfurl at the rate of six issues per month. We now have 24 added to the fifty or so already issued. At this rate the reissue programme will continue well into 2008 and will be making serious inroads into the bank accounts of the lovers of fine music everywhere. Finzi was always close to Lyrita’s heart. Their earliest stereo LPs from the late 1960s included two albums of Finzi’s Hardy songs in which the accompanist was Finzi’s friend the composer, Howard Ferguson. I hope that these will be reissued as part of the programme. To date we have had three Finzi CDs (Intimations; Boult short orchestral works; Concertos) and this is the fourth disc. It’s usual because it is generously timed but unusual because it gives us a Finzi recording never previously issued. That new recording is the ten movement half hour long suite of music from Finzi’s score for a BBC 1946 broadcast of Love’s Labour’s Lost. It’s for full orchestra so you can ignore the statement on the tracklisting that it is only for string orchestra. It’s the same score as that first recorded in 1987 by William Boughton with the English String Orchestra (augmented) most recently on Nimbus CD NI 5665. There are some typically smooth Finzian touches such as the wide Nobilmente theme in the Introduction. Moth is fanciful and flighty and includes a rather Holstian viola solo. The Hunt has plenty of rustic playful antiphonal brass work. One of the nicest episodes is the floating string writing with wind solos above in Dance. Clowns has a touch of toytown pomp about it. Who would ever guess this was by Finzi – perhaps Prokofiev or maybe Arnell. The Three Soliloquies are core Finzi and have been recorded freestanding by Boult on his Lyrita anthology. It’s a pleasing suite. The cover of the booklet is taken from the LP cover design of SRCS 93 on which was issued in 1983 the remaining tracks on this CD. Let us Garlands Bring was written for Vaughan Williams birthday in 1942. It is here sumptuously recorded and sung with unparalleled attention to meaning and variation in hue and emphasis by John Carol Case. The warmth and texture of the strings pleases still but by this stage in Carol Case’s career his vibrato had developed a serious wobble which asserts itself whenever the voice is put under pressure in slow music. This is especially true in Fear No More The Heat of the Sun and Come Away Death. Because of the other qualities of this recording one can and does forgive this but best to be aware of this. The buoyancy and ardent smiles of the last two songs O Mistress Mine and It was a Lover and his Lass erase all the demerits. The voice and intelligent apprehension of Ian Partridge is a national treasure. This is to the fore in the two diptychal works for tenor and orchestra: Two Milton Sonnets and Farewell to Arms. Making what could so easily have become mournful and lachrymose Partridge and Handley reveal the transcendent starry majesty of When I consider and the lightly melancholic How soon hath time with its characteristic absorption in the transience and sweetness of life. 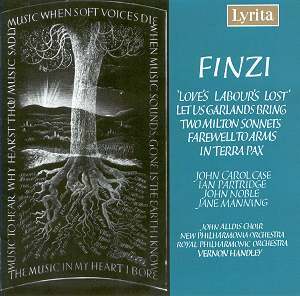 In Farewell to Arms Finzi sets two poems which in related imagery conjure the stuff of war to that of peace and of youth to idealised old age. In Terra Pax brings us to the grander choral Finzi in a starry ice-crystal Christmas scene recalling for me the wintry wanderings of Arnold’s Scholar Gypsy in RVW’s Oxford Elegy. This is the version for full orchestra. John Noble is a leonine-toned rustic-accented narrator. It is most nobly paced by Handley and should always be unhurried. The heart’s ease of the perfectly judged string statement at 8:53 followed by Jane Manning’s clarion Fear Not is breathtaking as is her ethereal ascent to the words ‘which is Christ the Lord’. Then we get the great bell carillon of the skies as the choir sing out Glory to God in the Highest at 11:50 topped off by the eager excitement of the strings at 11:34. The music curves down into a contented evocation for the baritone and strings on the words ‘th’ eternal silence’ reaching across to Finzi’s own 1949 Intimations of Immortality which use exactly the same words in a similarly heart-stopping moment. The extensive notes are by the first of Finzi’s biographers, Diana McVeagh whose new book on Elgar is just out. She has been a fixture with Lyrita since the issue in 1975 of Intimations of Immortality on SRCS75. All the sung words are printed in the booklet.